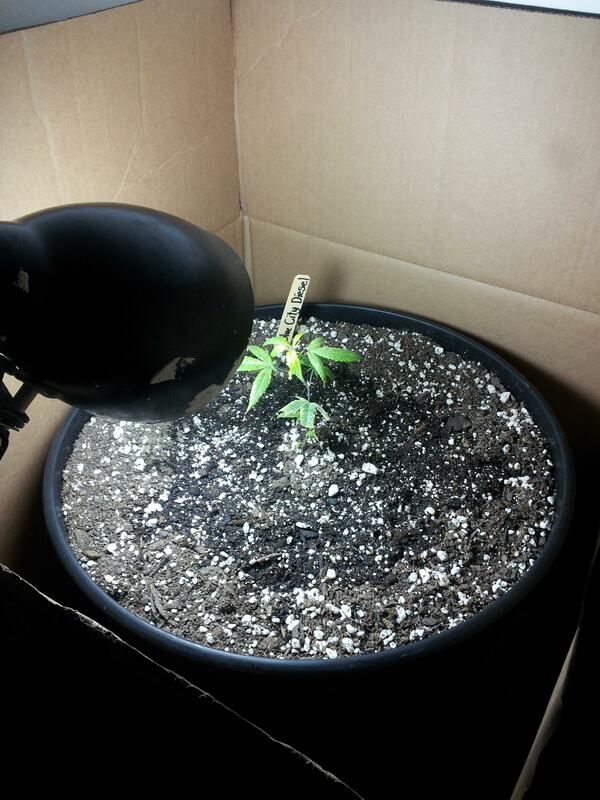 After a long hiatus, im back at growing da weed. A little history. 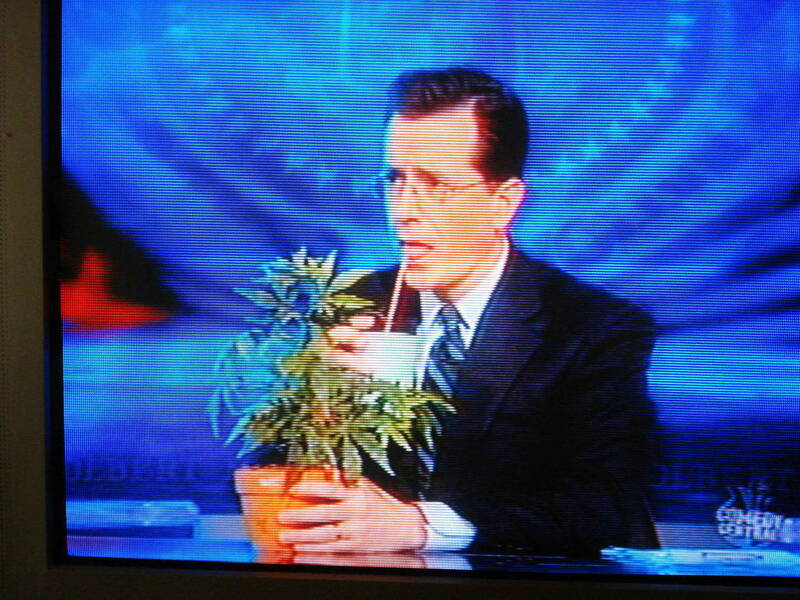 My first grow was going great, an indoor all cfl grow, but i got caught by the cops with my big mouth and they killed my plant. Fail One. Fail two last year. 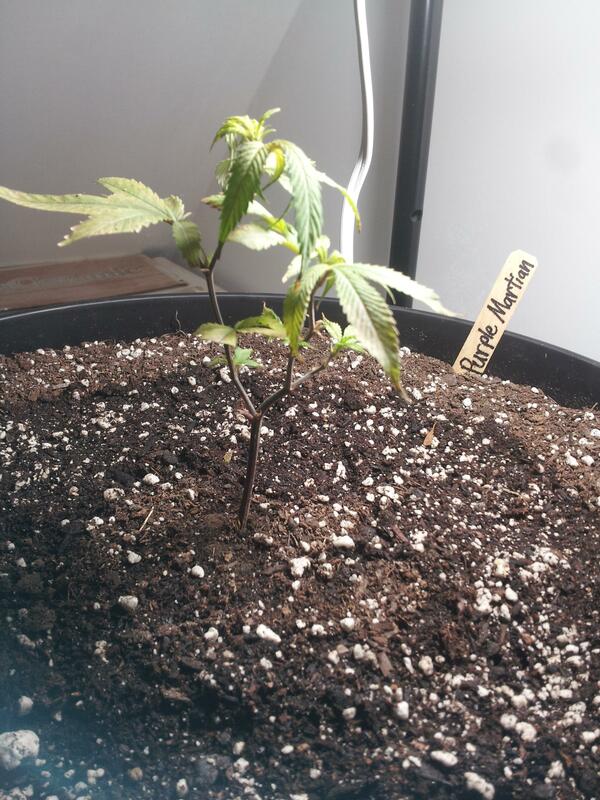 I tried to grow an OG Kush outdoors. It got cold, i killed it. Very sad. Third attempt, today in 2017. I got these two plants for Christmas as an Xmas present from my GF. 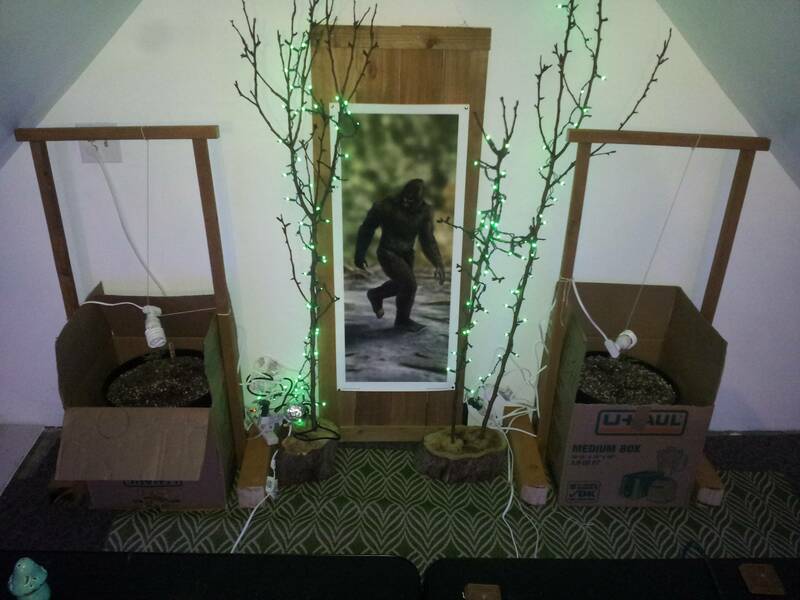 And she was kind enough to gift me a "Grow/Hangout Space" in the upstairs garage as well. Changes Ive made so far: Ive currently got two large black pots (not sure the size). These ones pictured will be their final pots. They came from the small starter pots that most herbs u buy at stores come in. Ive changed the lighting. For 3 weeks, BCD had a 27 watt 5,000K CFL inside an old desktop lamp and the PurMar had a 19 watt 5,000K CFL bulb hanging from a wire. Both plants are inside FoxFarm Ocean soil and Im using FoxFarm Grow Big liquid ferts with a 1-2 capful to 1 gallon mix rate. Also, Ive cut some sick-looking leaves off or just trimmed them to help the plants grow better. I didnt take any good pics at the time I was gifted them at Christmas, so these are my starting photos. In the near future, I want to create a nice-looking homemade cedar wood Hang-man type structure that goes around the pots (one structure for each pot) to hold up a custom-made wooden light holder. 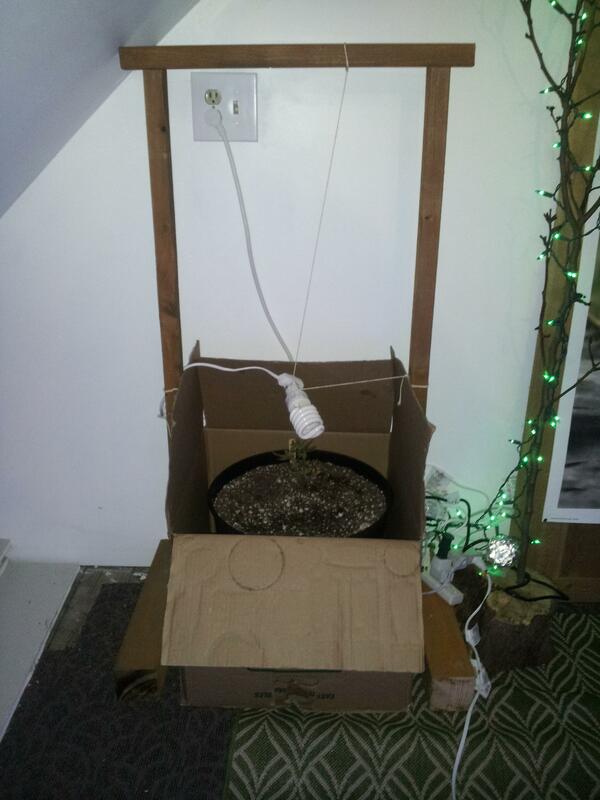 The wooden light holder will hold my grow bulbs and will be supported by chains connected to the Hangman-type structure. 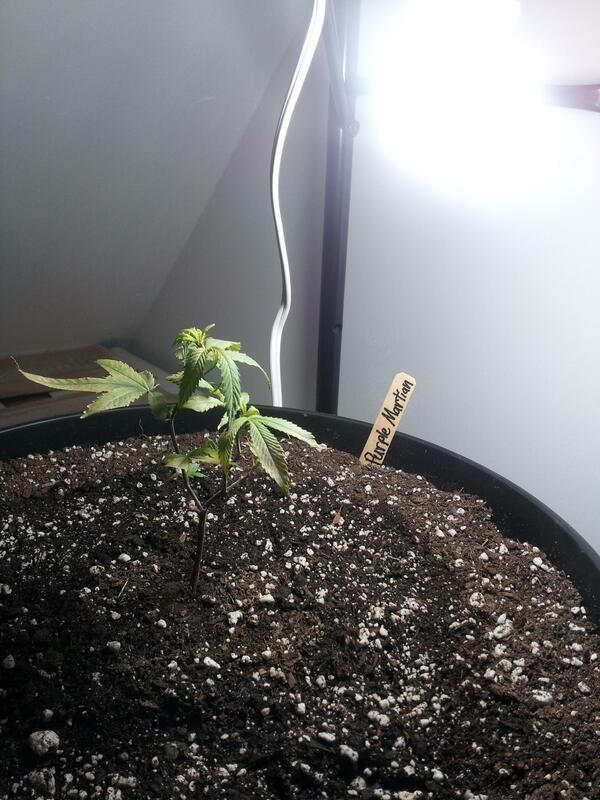 Three reasons why Im using CFL over HID or HPS. 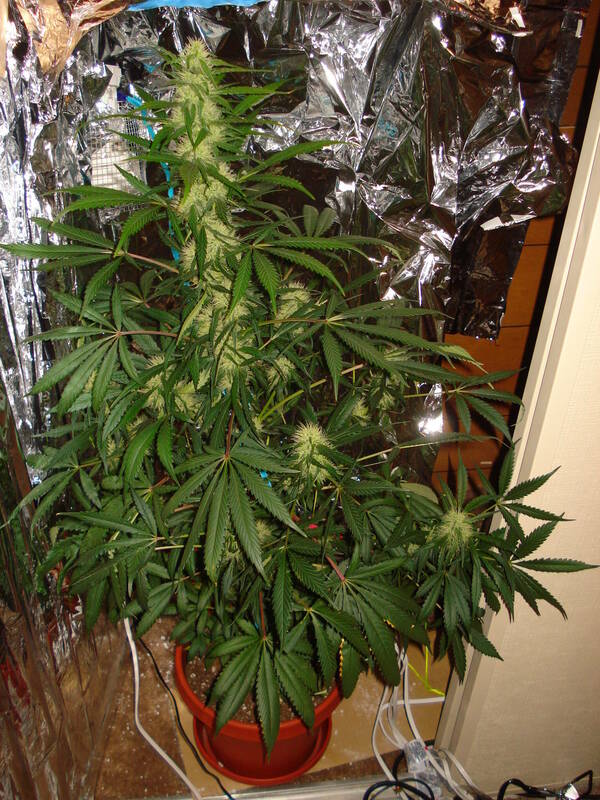 First, its what I started with back on my first grow in 2010. 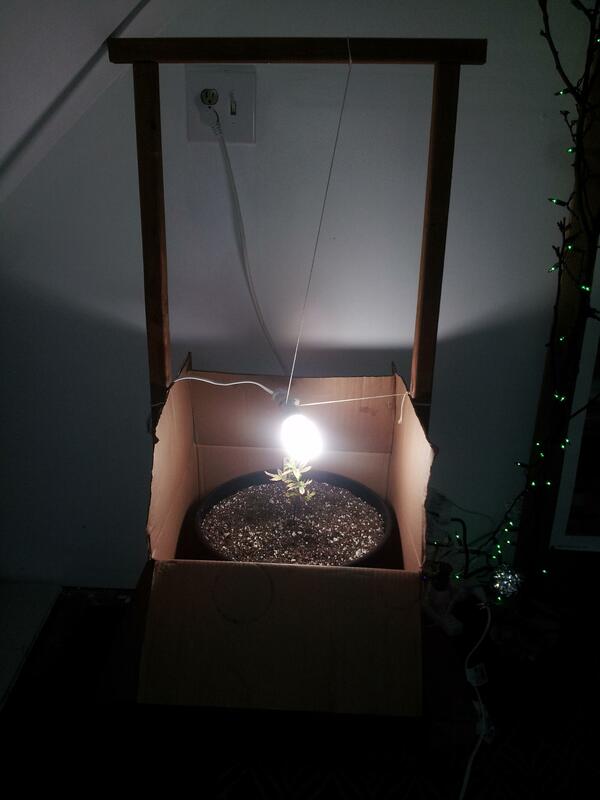 I want to see what results i can get with just CFL lighting. Secondly, its quite cost effective and efficient and i dont have to spend a ton of money on it. Third, it provides some heat with light. I feel that LED wouldnt make enough heat (Im not using a heater yet, hopefully not ever). I need some heat from the light source to warm the plants up a bit since it is January in the PNW and its quite cold at night. Sometimes freezing. Ive noticed slow growth which i expected from the cold weather. Good luck, and you know what "they" say if at first you don't succeed try,try again. A little advice I'd get a digital thermometer n see what ur temps are overnight, if it gets as cold as you say you might wake up to a dead plant. I will look into that. Also, i just found out Ocean Forest is loaded with organic ferts so i should feed plain water to my plants. Im avoiding Ocean Foest next time, i didnt know it was "pre-fertilized". Me no like that. Sweet grow man I'll be watching . I use ffoc soil good stuff don't have to feed for like the first months easy peasy ! But each to there own! Yah, i stopped feeding when i read in a thread the soil is "hot" (meaning packing with nutrients). Im trying both water and diulted Grow Big to see what happens. 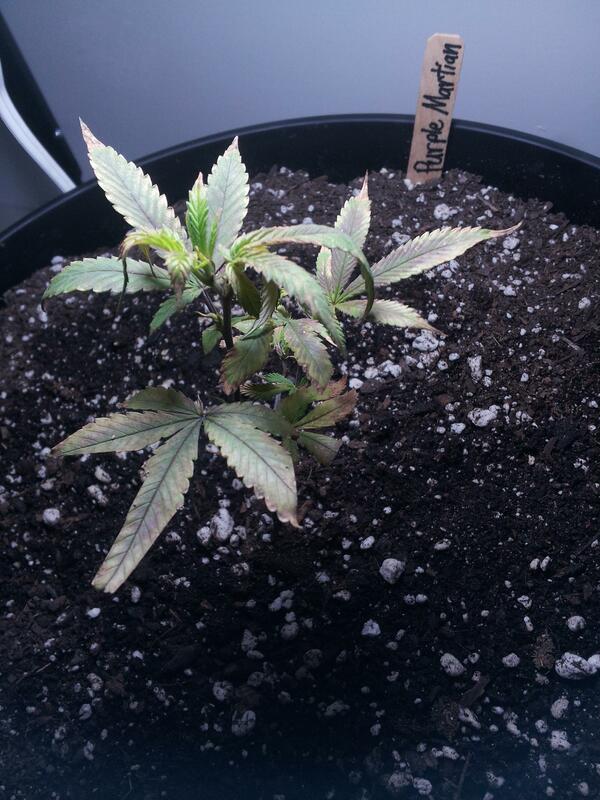 My Purple Martian is doing pretty good. Ive noticed some purple on the leaves! 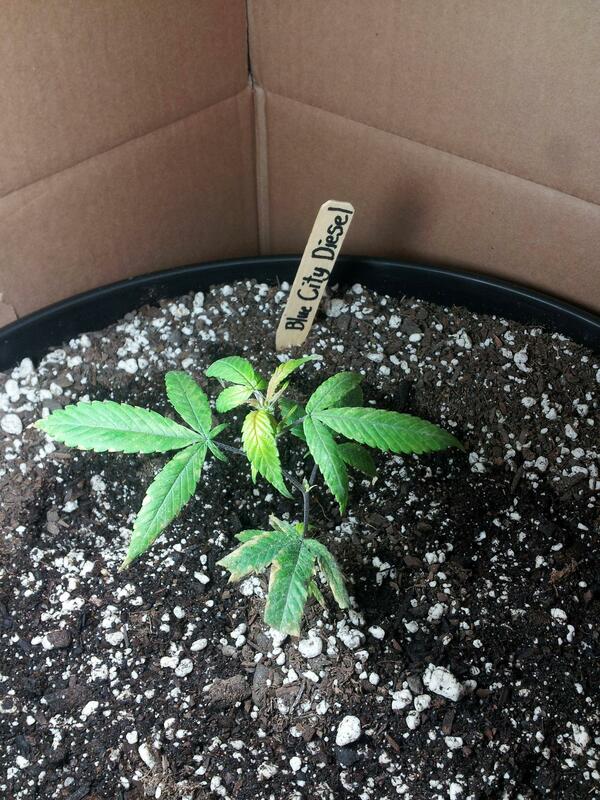 I hope thats from the strain and not some nutrient deficiency. Ive also noticed the lower leaves are browning on the edges. Not sure why. Nice green on my Blue City. The lower leaves do have more browning on the edges than the Purple Martian, but I will deal with that later. There is some green/light-green splochyness on the leaves. Not sure what that is. Also i noticed some purple coloring on the top leaves. Not sure if its from the strain or not. I wouldnt feed them!Give just plain water phed . Those plants are def. burn and or locked up? 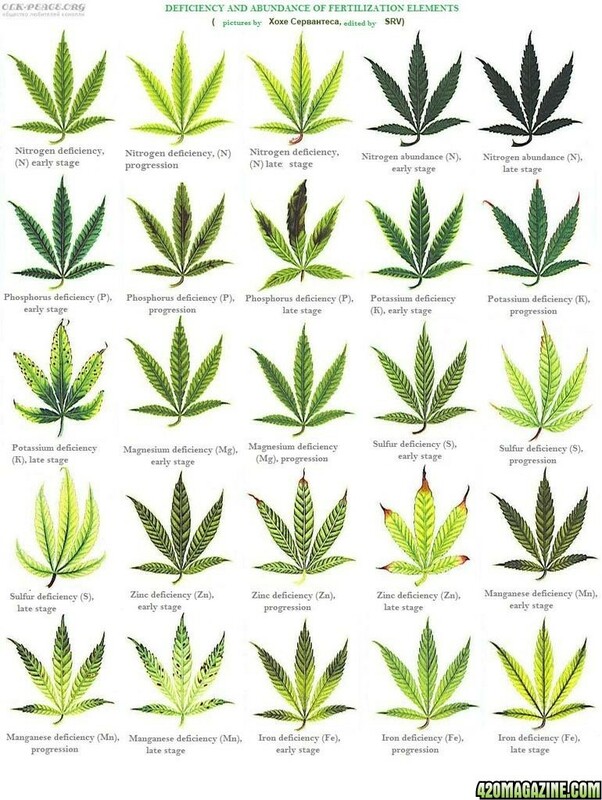 Just give them plain water for a while they should bounce back and green up.keep us updated also you can tell by the stem being purple don't think its strain realated. Yeah those plants look pretty unhappy. 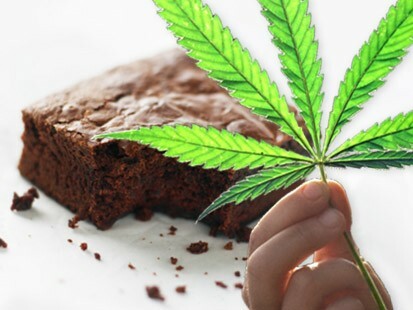 I'd do what bud grower suggested. Could it also be cold stress? Im growing in my garage and it has no heating and no insulation. Likely geta into the low 40s. Wish i could but the power bill is currently really high and i cant heat the room. My GF pays the power since its her house. True. cant put inside the house, no room. But im confident they will survive. I just put a cardboard box (Ghetto Tek!!!) around my Purple Martian. 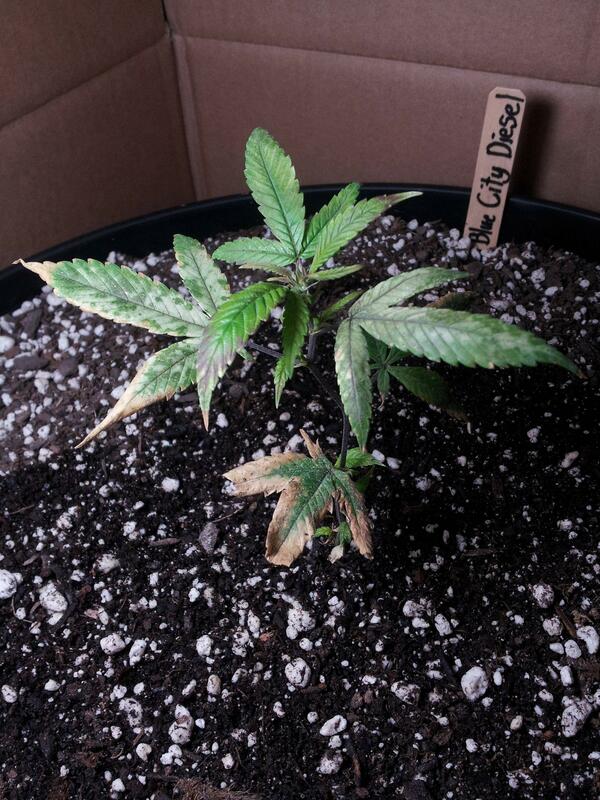 It wasnt looking so good, getting purple in the leaves and stems, likely from the cold. Im hoping this will help it out. Hope it helps ya out! Best of luck on your gorow OP. My GF gave me $40 for food so i could keep my stuff i bought. So glad they came out like i imagined them. 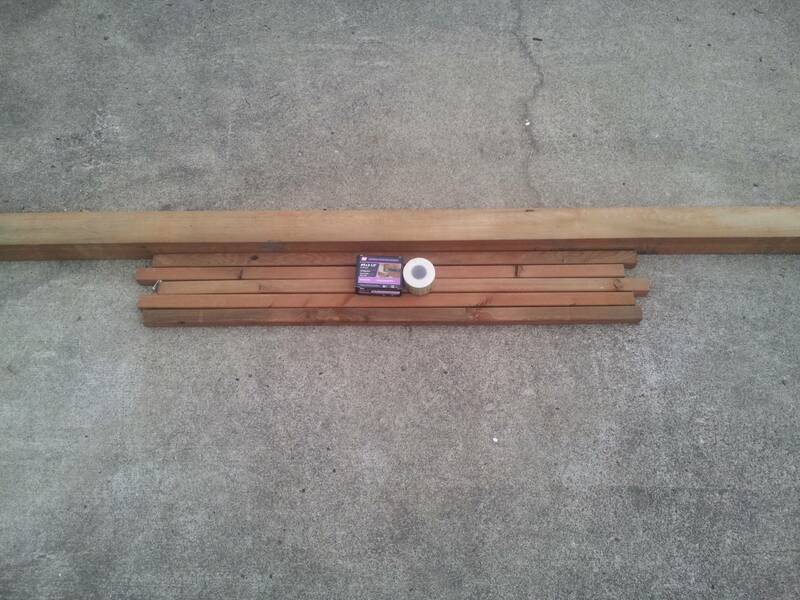 In the future, im going to make an add-on for a cedar frame that holds the lights and reflects them too. I like that bigfoot poster!!! Hey, good luck with this grow!!! 8,517 topic views. 0 members, 21 guests and 29 web crawlers are browsing this forum. Generated in 0.032 seconds spending 0.004 seconds on 17 queries.